Former Exeter and Wycombe striker Richard Logan is training with Torquay United and could sign a deal at the League Two side. Logan, 31, after just four months with the club, having previously spent at St James Park. "He's just training with us to see where he's at," Torquay boss Martin Ling said told BBC South West Sport. "He asked if it was alright to come training; we'll see where it takes us." Logan, who has been at Torquay for the past few days, has only just become eligible to play league football after his release by Wycombe. Under the terms of his release he was not allowed to play at Conference level or above until January 2013. Asked if he would sign Logan, Ling responded: "You never know. You never say no and you never say yes. "He's a player that's out there doing nothing. He's 31, had an effect with Exeter last year, but he had no professional club to go to." Logan spent three months on loan at Torquay between December 2001 and March 2002 when he was at Ipswich, scoring four goals in 16 games. 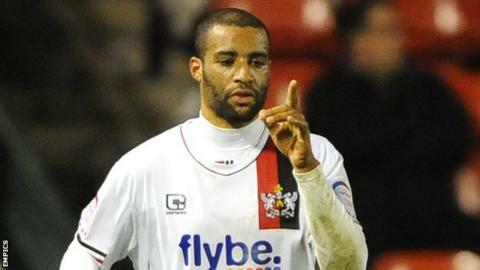 He joined Exeter in January 2007 on a free transfer from Weymouth and during his time at the Grecians scored 48 goals in over 200 appearances.